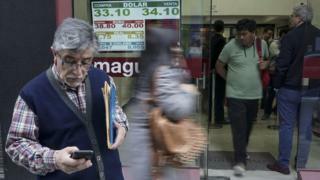 The value of Argentina’s peso continued to fall on Thursday, plunging by more than 13% after a 7% drop a day earlier. The decline came despite the central bank’s effort to stabilise the currency by raising a key interest rate to 60%. The bank said Thursday’s rate hike, from 45% to 60%, was a “response to the foreign exchange rate situation and the risk of greater inflation”. On Wednesday Mr Macri asked the IMF to speed up its $50bn bailout and the fund agreed to revise the original plan, citing “more adverse” market conditions. But not if investors believe the peso won’t be worth much a year from now, which is what is triggering the current devaluation. Ultimately there is a lack of confidence in the government’s ability to do the reforms it promised the IMF. The IMF’s director general is still sticking to Mr. Macri’s plan. But markets are not going along with them. The move heightened investor fears about the country’s economy. The IMF said last month it expects Argentina’s economy to stabilise by the end of the year and a gradual recovery to begin in 2019.